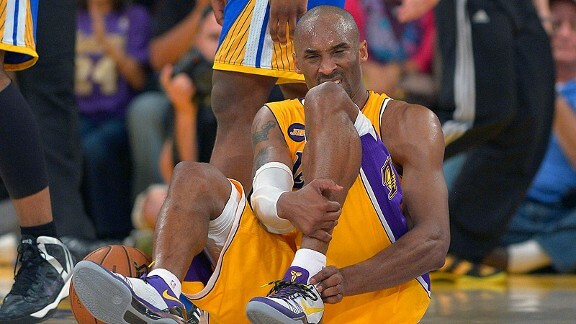 Kobe Bryant injured his Achilles last night at the Staple Center. Will the Lakers star ever be the same? One of the toughest players that the NBA has ever seen tore his Achilles tendon last night at the Staples Center. Kobe Bryant, who is universally recognized throughout the sports world as one of the grittiest, toughest guys around, will not be able to play through this injury. Earlier this season, Kobe admitted to the media that next season would probably be his last in the NBA however this injury has now put that in jeopardy. Although he is only 34 years old, this is his 17th NBA regular season to go along with another 236 combined playoff and Olympic contests. Kobe has played over 54,000 minutes in his career. He’s been able to play through some tough injuries in his career and has an incredible amount of “mileage” on his body. Whether this injury hinders Bryant’s availability for next season remains to be seen, however, the much more important question is whether or not Kobe will ever be able to get back to being the same player that we all remember and revere. If he doesn’t then there could be a complete shift in thinking for Jim Buss and Mitch Kupchak. This injury to Kobe effectively ends the Lakers chances of making any type of noise in the playoffs (if they even get there now), however, call me crazy, but this may be a blessing in disguise for a Lakers franchise that has some crucial decisions to make this offseason in regards to their future. It’s been blatantly obvious to anyone who is paying attention that Dwight Howard and Kobe Bryant don’t get along. Kobe is old school; Dwight is new school. Kobe is tough minded; Dwight is weak minded. Kobe is always serious about his craft; Dwight just wants to have fun. Kobe is the ultimate Alpha-Male; Dwight just ain’t about that life. With all that being said; Kobe may never be the same player again and Dwight is currently entering what should be the prime years of his career. Think about it…what NBA Center is competing with a healthy Dwight Howard on a nightly basis? We all know damn well that the answer is nobody and so do the Lakers. Would the Lakers really be willing to lose Howard to free agency in order to keep Kobe Bryant, a player who has meant so much to the franchise but whose future is unclear? To me, the answer is yes because there is another possible scenario in Lakerland that is much less obvious and much more likely. The Lakers allow Kobe to leave on his own terms, which means rehab and return from a major injury, in effect keeping their relationship in tact with the player who some consider the greatest Laker of them all. This also means losing Dwight Howard in free agency to a team like Houston who will have the available cap space to offer the maximum 4 year, $87 million dollar contract that Dwight most certainly desires. This seems like a dumb move right? Could LeBron James end up on the Lakers? It’s a reasonable thought. What ends up happening is after 2014, Kobe retires and LeBron James becomes a free agent if he chooses to opt out of his contract with Miami. If the Lakers let Howard leave and Kobe retire on his own terms, they will have enough cap space to max out LeBron next summer. Don’t rule out this very reasonable and likely possibility because LeBron has goals that reach far beyond basketball and Los Angeles is a place where he can obtain those goals. There is no such thing as good timing when it comes to an injury from a player’s perspective, but from a management perspective, I can see this being the catalyst for much needed change in Lakerland. This entry was posted in Absurd, NBA, Uncategorized and tagged Dwight Howard, kobe, Kobe Bryant, Laker, los angeles, Los Angeles Lakers, National Basketball Association, nba. Bookmark the permalink.